Rust Bullet Standard Formula is now named Rust Bullet Industrial. The new name more clearly indicates the durability and effectiveness of Rust Bullet's flagship paint. This is an industrial strength paint meant for use in demanding situations. Whether is your need is for steel roofing, an automotive undercarriage, marine use, farm equipment or a rusty railing on the front porch, Rust Bullet Industrial is as tough as paints come. 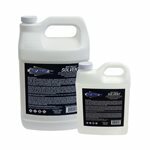 Rust Bullet protection now has only 97 grams per liter of Volatile Organic Compounds. 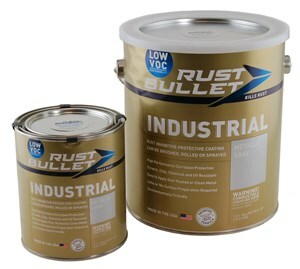 This makes Rust Bullet Industrial Low VOC compliant in all US states and air quality management districts. Rust Bullet also contains no zinc, no chromates, no acids, and no heavy metals. For best results 2 - 3 coats of the Industrial Low VOC formula are recommended, not including any Color Shell or Clear Shot top coats. Please read and follow all instructions before applying the product. Rust Bullet Industrial Low VOC is metallic gray in color. Rust Bullet Industrial Low VOC may brushed, rolled or sprayed over clean or rusted metal. Minimum two coat application required. 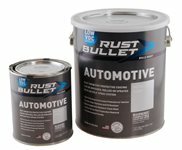 Rust Bullet Industrial Low VOC provides rust protection in two ways. 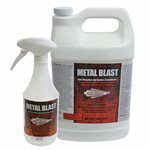 Not only is it a durable barrier coat that seals off metal from corrosion inducing water and oxygen, but Rust Bullet has a high metal content in the paint as well. The metal in the paint gives it a sacrificial metal aspect. If the paint layer becomes compromised, the aluminum in the paint begins to oxidize before the metal substrate underneath. 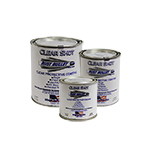 This give Rust Bullet an additional measure of rust prevention that other coatings don't have.